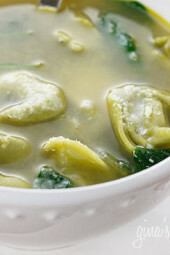 What can be more comforting than a hot bowl of soup, like this spinach tortellini en brodo, on a cold winter night. I also love making this soup with Turkey Meatballs too for added protein or with mushrooms if I don’t have spinach. I don’t know if it’s cold where you are, but here in New York, it’s that kind of bone-chilling cold that requires you to wear hats, gloves and cozy sweaters. Hearty soups for dinner are always the best remedy. Some other favorites are Chicken and Cavatelli Soup, Roasted Brussels Sprouts and Cauliflower Soup, and Asian Beef Zoodle Soup. I’m feeling a little under the weather today, and this hot soup is exactly what the doctor ordered. I’ve had my eye on Bell’alimento’s tortellini en brodo and had all the ingredients to make this. I met Paula back in October at the Pom Wonderful Harvest Fest, she has a beautiful blog and a way with words. This soup is great when you want to make a quick one pot meal. I used Buitoni Spinach Cheese Tortellini which were great tasting, and had the least amount of fat. I also added some fresh baby spinach for some added antioxidants. Enjoy! In a large pot, melt the butter over medium-low heat. When melted, add the celery, onion, carrot & garlic. Cover and reduce heat to low and cook for approximately 8-10 minutes until vegetables begin to soften. Add the chicken broth, water, rind and increase heat to medium-high and bring to a boil. When broth boils, add salt (to taste), pepper and nutmeg. Reduce heat to low and add tortellini. Simmer until tortellini cooks to al dente. Once cooked, remove the rind, and add the baby spinach. Garnish with freshly grated Parmigiano Reggiano! Gina – Thanks so much for this recipe! I was a little hesitant about the nutmeg so I only used a 1/4 teaspoon and it came out delicious. The broth is so delicately flavored. Beautifully simple. Perfect for winter. I love how easy and delicious this soup is! Making it again tonight. Thank you for all of your wonderful recipes GIna! Made this tonight for the first snow fall of the season. One of my favorite simple soups! I'm doing Weight Watchers and decided to make this last night for dinner. Me and my husband thought it was delicious! Very easy to make and quite filling. I highly recommend using that cheese rind if you can. Many people throw it away but when used in a broth, it really adds major cheese flavor without having to pile on the cheese at the end. The only change I made to the recipe is that I used fat free/low sodium broth, added an extra cup of spinach (love that stuff), and threw in a pinch of crushed red pepper flakes for a little bit of heat. This was AMAZING and so easy!!! Thank you!!! Wonderful!!!!…. This was really tasty. Hubby and son loved it too. Quick to make and we didn't miss the meat at all. Placed in recipe rotation for sure. I've made this a few times. I usually add some cooked shredded chicken and a ton more spices as it tastes a bit bland. I also leave out the water to bump up the flavor. Shaved parmesean makes this whole dish! I noticed myself adding a little more salt and nutmeg than the recipe calls for. I also added some crushed red pepper flakes. Added some cooked chicken and mushrooms that I had on hand.. Delicious. Used the cheese rind . It added tons of flavour in combination with fresh grated nutmeg. Thanks for the great tummy warming recipe! My husband and I loved this recipe! So simple and delicious. I think the nutmeg really takes it to the next level. Delicious soup! When I put the recipe into the builder though, I got 4 PP per serving or 9 PP for two servings. I didn't change anything or make any substitutions… any idea why this might be? Thanks for all that you do – I LOVE your site! Every time the seasons change, I get a bad head cold and feel miserable. I looked for some brothy soup recipes on your site, and this was the first one I tried. I thought a spinach soup would be pretty bland, but it was fabulous! I think cooking in the parmesan rind added so much depth that I didn't expect to be there. Thank you for making this week more bearable! I think I would like try to combine you Spinach Tortellini en Brodo and The Three Cheese Tortellini and Mushrooms soup together. What you think? Just for the record do not accidentally think that cloves are nutmeg because you're stuffed up with a cold and add 1/2t. of cloves to the soup. 🙂 It doesn't work out. DO love this recipe though. This is a great recipe. I'm not dieting at all, I just love healthy and simple food. Sometimes when I make this recipe, I mix it up by adding some crushed or petite diced tomatoes instead of carrots and substitute beef broth for chicken, or make it with veggie broth. This is one of my very favorite recipes (of yours). The sweetness of the cheese, the earthy spinach, the sweet carrots, and savory celery… just comes together in the most satisfying need filling dinner and the points are so low for such a generous serving. I made this tonight and it is sooo good! Just wondering — what kind of chicken broth did you use? Regular? 99% fat free? Fat Free? I'd just like to say WOW just WOW. This recipe is to die for. I just made it for dinner and its so easy to make, delicious and super filling! Another great recipe! I have many of your recipes on regular rotation in my household. Thank you so much for your delicious recipes! Again, another great recipe! I actually didn't have celery or carrots but plenty of spinach, so I just made it without the celery and carrots and it was wonderful! Very filling and got in a ton of spinach! Next time I'll be sure to have the celery and spinach because the sweetness of them probably make this even more tasty! Thanks again! Of all your recipes that we've tried so far (MANY), this is my favorite! We made this on Sunday, ate leftovers Monday night and now Tuesday lunch. In this short time, I did not notice any mushiness to the tortellini. To abbyb1: My hubby and I call ourselves "SkinnyTaste evangelists" – we LOVE spreading the word, even to cashiers at WalMart! Reminds me of growing up with my grandmother! I love your blog and "pimp" it out whenever I can. Thanks Gina! Been using your recipes for years now and I'm never disappointed. This soup is absolutely amazing. The nutmeg in the broth really brings it home and adds something special. I love the old school use of the rind in broth. (Although still excellent without it) The taste of this soup literally brought me right back to the tastes of my Italian-American childhood. I find that Pasta tends to absorb all of the broth so when I store it in the refrigerator I seperate them into two containers and add the tortellini when heating up. (Old restaurant trick, that is how they serve soups with rice or pasta in them) Thanks again Gina. I don't know what I would do without your blog. 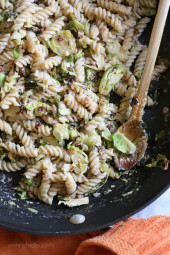 Any ideas on how to make this even lower fat buy subbing out the pasta? Cannellini beans maybe? I just made this soup and loved it! I did add the juice from a half a lemon. I find the acid gives the soup a bright and fresh flavor. Thanks for the recipe! The rind of the parmesan cheese if you are using it. "Add the chicken broth, water, rind and increase heat to medium-high and bring to a boil"
Silly question but what is meant by rind? How many tortolini's does this count for?? Does this recipe really call for 18 ounces of tortellini? It was delicious, but seemed like ALOT of tortellini and not much soup. Mary – Thanks, I'm happy you feel that way! This was delicious. The nutmeg added just a little kick. This really tasted… special. Like, a real treat. Gina, I've not made many of your recipes, but I've made 6 thus far, ALL of which have been amazing, and my husband (who usually hates my "health food" has liked every single one!). THANK YOU. I really appreciate your focus on using real, delicious ingredients (BUTTER, baby!) while still looking for ways to be live-able on the Weight Watchers plan in the long term. Thanks so much! Just made this last night. So good. And there is enough left over for lunch all week long! Yea!! Thanks, Gina. Your recipes are all outstanding! This recipe was wonderful. It was easy, quick and tasty. I think the fresh nutmeg makes a difference. My husband loved it and I have passed it on to other WW friends. Even good for my vegetarian friends by just changing to a veggie broth. Oh, I cut it in half for my husband and myself and added a lot more fresh spinach. I have enough for lunch tomorrow. Yumm! I've made this recipe several times in the past. Tonight, I'm going to make it with whole wheat tortellini's with cheese and garlic. I'm so glad to see a point value to it!! Gina, you are probably one of the most awesome people!! 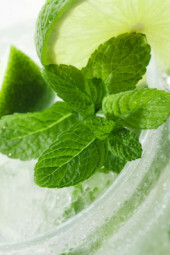 Thank you for putting these awesome recipes on your site!! I made this for lunch and all I can say is that you, Gina, are brilliant. Thanks for this site and finding the time to do all this. Wow, this soup was amazing!! When I first told my husband I was making "spinach soup" (a horrible description I know) for dinner a look of horror crossed his face. I almost talked myself out of making it; boy am I glad I didn't though! The only change I made was to cut the amount of celery in half and double the amount of carrots, based on my personal preferences of course. Thanks so much for a delicious recipe! Just made this! I only bought a 9 oz package of the spinach tortellini. I cooked half of it in the soup and the other half in water and then drained it immediately. Now I have it packed up for my H and I to take for lunch tomorrow. Thanks for the wonderful recipe! This soup sounds wonderful! Definitely a great comforting soup! The points may change with different tortellini, so I would check the points to make sure. And yes, there is a lot of tortellini in this soup which makes it so hearty and filling, but if you wish to use less, then it will be lower in points. I don't see why you couldn't cook the pasta separately, especially if you plan on eating this the next day. I like to eat it right after I cook it, left overs get mushy. I saw this recipe Thursday at work, stopped by the store and picked up the few ingredients I didn't have on hand. This recipe was so easy and yummy – even better the next day. It's a new staple on the soup list at our house!!! I like how you added baby spinach to the soup. I'll pick up some tortellini over the weekend and make a batch. I just cooked this tonight, and I have some questions: Does the brand of tortellini make a difference in point value? I added the tortellini and it cooked very quickly and there was lots of tortellini and very little soup. When I heat it up, I am afraid that it will turn to mush. 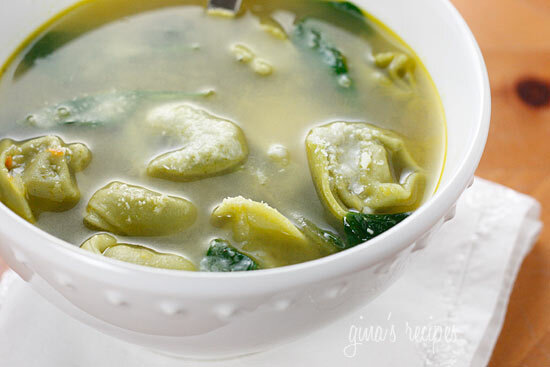 Do you think you can cook the tortellini separately, then add it to the soup? We loved the taste; the nutmeg was a terrific addition. And we love all of your recipes! They are our WW mainstay! Weight Watchers had a soup similar to this in a cookbook a long time ago, but it had a can of diced tomatoes in it as well and no Parmesan cheese. Yum, I can't wait to try yours. you are so right about this New York weather – freezing! but this recipe would make any cold night better! It may change slightly, it's hard to say without recalculating. If it does change, maybe 1 more point? Hi Gina, this looks awesome! If I use regular cheese tortellini (as that is what I have on hand) will it change the points value? LOVE your site, I make so many things from here! I used to eat this in Sicily ALL of the time!! Yuum…sounds like a great idea for this old wintery night!! Looks fabulous! And yes, it is cold these days!! This looks great! Perfect for a winter night. I love this soup. It's so simple and so comforting. What a cool idea! I love the buitoni ravioli but making a soup with them is even better!! This looks fantastic! 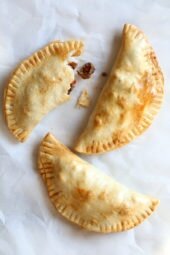 Gina, you have a wonderful blog, and I love finding simple recipes like this. I keep all of these things on hand, save for the tortellini, and will definitely be adding this soup to my menu next week. Looks like a perfect Meatless Monday meal! I'll have to fix next Monday…when it is supposed to be cooler. Thanks, Gina! Mmm, that sounds great. And you're so right about the bone-chilling cold of NY this time of year. Coincidentally I bought a huge box of Buitoni spinach tortellini and have all of these ingredients on hand. I believe my fiance will be thrilled to have this for dinner tomorrow night! Thanks for the great recipe!